It's 15 mins. past midnight, my second favorite moment besides twilight zone; it's the most peaceful moment that you can be alone, what will you do? I used to study late when I was busy with my design presentation, then worked late when I was O.T. for my unfinished office stuff at home, year after years ......in a complete darkness outside my window, street lamp poles are my companion. I wished I could have a walk outside if I was not had a deadline, what a desire. For now, there is no need to stay late so often, but I tend to do so in purpose, just want to recapture the silents in the air, writing blogs or reading others, planning for my next move or simply take a break to refresh my mind...how about you? I know the color tone is a bit strange but this is the true environment of what my "onsen" milk is waiting for in it's fridge. Japanese are proud of their onsen, most of the Hong Kong people love it, too. I have to say it is a A+++ grade of luxurious experience especially to enjoy their seasonal dinner after running a comfortable onsen "dip". But you may also heard that they will always recommend you to take some milk right after leaving the onsen, as a supplement of water lost; you will find exclusive milk supplied by your ryokan and ...... that's why I've prepared one for myself. I just bought it from a vending machine in their lobby, so convenience and lovely, too. See it's packaging design, quite local made although I'm not sure whether it is? So, I follow the "instruction" and you know what...... a glass of water can do, BUT with the addition of premium value to this bottle of milk, i.e. : the myth, its' home made feel, freshness + the moment of where you are (at your vacation) and the desire of waiting to taste ......it's definitely can comfort and rejuvenate a traveler, or a shopaholic. Happy Easter ! Mosaic - 馬賽克, 誰不喜愛? 繽紛的色彩, 大大小時不同的形狀, 自由組合也可, 採用設計師悉心配襯的亦可; DIY 朋友的寵兒...不須要遠走意大利, 西班牙, 在澳門隨處可見. 還記得小時候跟家人往澳門遊玩, 最深刻的當然不是賭場或豬肉乾, 白鴿標檔排第二, 商店前面行人路地上的馬賽克 /瓷磚排第一. 我想當時店主是為了方便打理, 才各自在門前的行人路上貼上馬賽克 /瓷磚, 由於這不是"街坊會的安排", 所以大家並沒有互相配襯, 結果便漫不經意地完成了一條又一條自家製作而又獨特的"藝術街"! 現在? 以上情境不常見,卻在大街小巷發現不少上圖的馬賽克裝飾, 跟議事亭廣場的設計十分配合; 簡簡單單的圖形及色彩, 已為整個環境修飾得十分優雅; 更令又長又悶的階梯變得有趣味, 不消一會便走完. 所以, 至今, 馬賽克還是我的最愛. Mosaic - all time favor ? so colorful, interesting shape and size, it can be created through your imagination, or by select a designer's choice...DIY lovers. What you don't need is to search them around in Spain or Italy, it's everywhere, just right next in Macau. I used to travel with my family to Macau when I was a kid, the most remarkable memory in my mind was certainly not casino or BBQ pork. 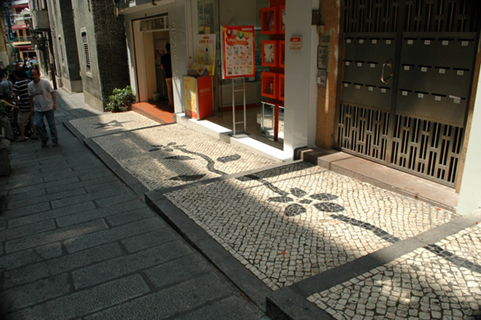 Something call 白鴿標 - first runner up (direct translate is "Pigeon Ticket" - a kind of lottery ticket, you won & get pay if you guess the correct Chinese character that are going to be randomly picked once or twice a week by the host), mosaic / ceramic tile laid in front of shops on the pedestrian is the winner. I think the original thought of the shop owners may just think of easy maintenance & therefore have this idea, and luckily without the master control of any committee, they created an unique street art by their own mix & match, one follow by the others. Today, it will be less likely to find the trace of the above, but something new like the one in my photo which can be discovered everywhere, seems they are a diversified "team member" of the major design found at Senado Square. By this simple pattern & color arrangement, it lift the whole atmosphere of the surrounding, more decorative and interesting, even shorter the length of long boring staircase, what a magic touch and that's why, mosaic is still my number one lover.